Finished the Manos shawl. I used my Carmen’s Shawl pattern with a 7mm hook and managed to get a reasonable sized shawl out of one 100g skein. I added one row of double crochet (single crochet in US terminology) to the edge, and I think this gives a nicer border to the shawl. I’m thinking of frogging the lace weight version, as I think the pattern works better with a heavier weight yarn. 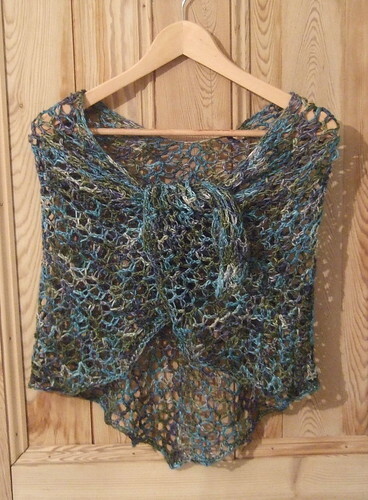 Very impressive….that you completed this entire shawl with ONE skein of Manos del Uruguay yarn! It’s lovely. Beautiful-thanks for sharing the pattern (again). Did you use a 7 mm UK hok or US hook?